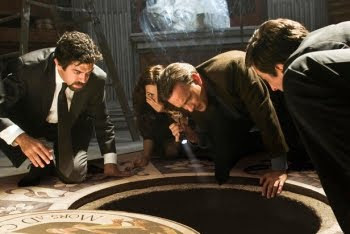 Ron Howard's ultra-successful adaptation of The Da Vinci Code took Dan Brown's exhilarating novel and, somehow, managed to only filter out a watchable, stiff mystery that dodges the whimsy and fun of its page-a-minute inspiration. So, naturally, both excitement and reservation could be felt when the announcement came that Ron Howard and his writers would return for an adaptation of Dan Brown's superior novel, "Angels & Demons", a story that easily bests his claim-to-fame piece of work by being far more suspenseful, leaner, and all-around "cinematic" within its prose. Luckily, Howard and company deliver exactly what's expected in a film adaptation of Angels & Demons -- tighter suspense and less meddling plot elements -- even though they make several of the same mistakes as The Da Vinci Code with weak chemistry and single-dimensional tones. Once again, we follow Robert Langdon (Tom Hanks) as he blitzes through an overnight puzzle-solving race, one that only his symbologist brain can dissect. He's hurriedly trying to save four Catholic cardinals from being murdered, an act of religious terrorism sparked by a secret organization called The Illuminati amid a papal election. The cult organization threatens to have a deadly hassassin (an Arabic derivation of 'assassin') kill one of these four cardinals -- the 'preferiti', or the preferred individuals to take over the Pope's duties -- per hour at significant "elemental" spots until midnight, where they'll then explode the Vatican City in a flash of light. That 'flash of light' refers to an explosion from a vial of antimatter stolen by the Illuminati from the Large Hadron Collider, a project in matter creation that Robert's sleuthing companion Vittoria Vetra (Ayelet Zurer) oversaw as a CERN scientist. 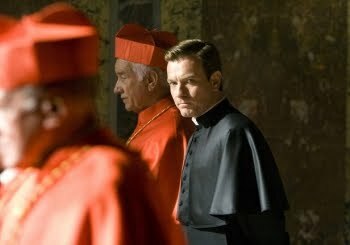 With the help of the intermediary pope, the Camerlengo (Ewan McGregor), and the head of Swiss/Vatican Police Commander Richter (Stellan Skarsgård), Robert and Vittoria set out to make sense of the historic symbols and artwork scattered across the city that'll lead them to the end of the Illuminati's riddle-laden plot. Going in with hopes of seeing the book word-for-word spread across the screen will leave viewers as satisfied as, well, those who did the same with The Da Vinci Code -- not very much so. That's something I personally had to temper down, as an adaptation of "Angels & Demons" had been on my brain since the second after shutting the rear cover. Writers David Koepp and Akiva Goldsman have taken liberties with the narrative to make it more "filmic", all approved by Dan Brown as executive producer, but they've also made sure to stick to the core elements that shape the book into a real nail-biter. Angels & Demons isn't a prequel like the novel, but a sequel that uses Langdon's experience in The Da Vinci Code as motivation to bring him in on this new case. That's a shame since one of the intriguing elements in "The Da Vinci Code" novel occurs with repeated allusions to the events that "happened in Vatican City", but it's a negligible tactic in simplifying the myriad of story connections. Sticklers will spot other inaccuracies, like missing links between characters and alterations to the overall outcome of the murders; however, the script diligently adheres to everything it needs to illustrate the story's core purposes, building it into a fine standalone film that doesn't require knowledge of the former. Still, the devil's in the details. Some of these missing elements cause Angels & Demons to lose out on a fair share of intrigue and dimensionality on-screen, such as the void connection between Robert and Vittoria -- which, seen with a splash of flirtatious passion in the book, is crippled to barely more than a business association similar to Hanks and Tautou's link in The Da Vinci Code. Hanks loses his wild Nick Cage hairdo and finds a center with Langdon that comes much closer to the character's charm than he did with Da Vinci, while Ayelet Zurer rustles up a low key yet aptly realized turn as Vittoria. Her mannerisms fit Vittoria to a forgiving degree, reaching for her essence without tapping into the romantic link with Langdon. She's not a yoga-master sexpot sporting an earthy presence nor personally linked to any of the events in the book outside of being a CERN employee, lowering her to a face-level shadow who's missing a sense of stirring intrigue. That impression sums up the rest of the characters as well, from McGregor's Camerlengo to Skarsgård's police chief; they're all finely played and sketched out well enough, but somehow nondescript against the story arc even when they're growing more and more integral. However, what's the real point behind soaking in Angels & Demons? It's in all the puzzle-solving and red herrings that Robert and Vittoria follow through across Vatican City, which creates start-to-finish tension that mixes dashes of politics with a layer of intrigue about the endless religion-science conflict. Ron Howard has obviously taken some of the critiques shot at his first Brown adaptation to heart, because his second labyrinthine mystery easily bests The Da Vinci Code in suspense and excitement. He makes an effort not to halt the furious movement simply to badger us with textual explanations, a heavy-handed issue that transformed his first film into an overly talky mess. Instead, a lot of the explanations and historical wordplay occur in motion, during discussions with the police officers in darting cars and with the Camerlengo in brief but nervous spurts. It's anticipated for the novel's simmering intrigue to mount into a non-stop blur through semi-historical hearsay and compelling connect-the-dots mechanics, but it's worth praising Ron Howard's improvement in nailing down a vastly more kinetic line of gripping mystery. Both visually with cinematographer Salvatore Totino's photography and in the intricate production design, Angels & Demons continues the eye-candy magnetism from The Da Vinci -- which, by and large, is an impressive blend of artistry and computer-generated trickery that flows alongside the Vatican rat race with top-notch authenticity. Howard takes us through a myriad of locations across Rome where they weren't allowed to shoot (couldn't imagine why after the protests The Da Vinci Code garnished), many built on-set and featuring solid green-screen work. All $150 million of its production budget can be seen clear as day, through faux Raphael frescos and crowds upon crowds outside the papal election. It creates an claustrophobic yet "joyous" environment as history buff Langdon and Vittoria descend into the air-tight Vatican library for research, as well as the accurate settings of each of the elemental murder sites scattered across Rome. Essentially, what we're working with in Angels & Demons is more of the same from Howard's construction of Brown's neo-religious thriller universe, only with the dials cranked up a few notches to heighten the energy. For what it sets out to accomplish -- swirling together swift, vigorous suspense instead of a point-for-point adaptation -- it'll satisfy a curious need for unspooling, thought-provoking chills all the way until its mind-boggling conclusion. Even if it still wobbles and creaks along with the same stilted rigidity, follies, and adaptive faux pas as its "predecessor", the material skimmed from the top of the novel whips together into a taut little contorted thrillride. To answer the question likely simmering in many minds: yes, Angels & Demons outmatches The Da Vinci Code in a similar but more tightly-realized fashion, just remember to go in looking for a blur of fantasy breadcrumb suspense and not for some kind of history lesson or scene-by-scene replication of the book.